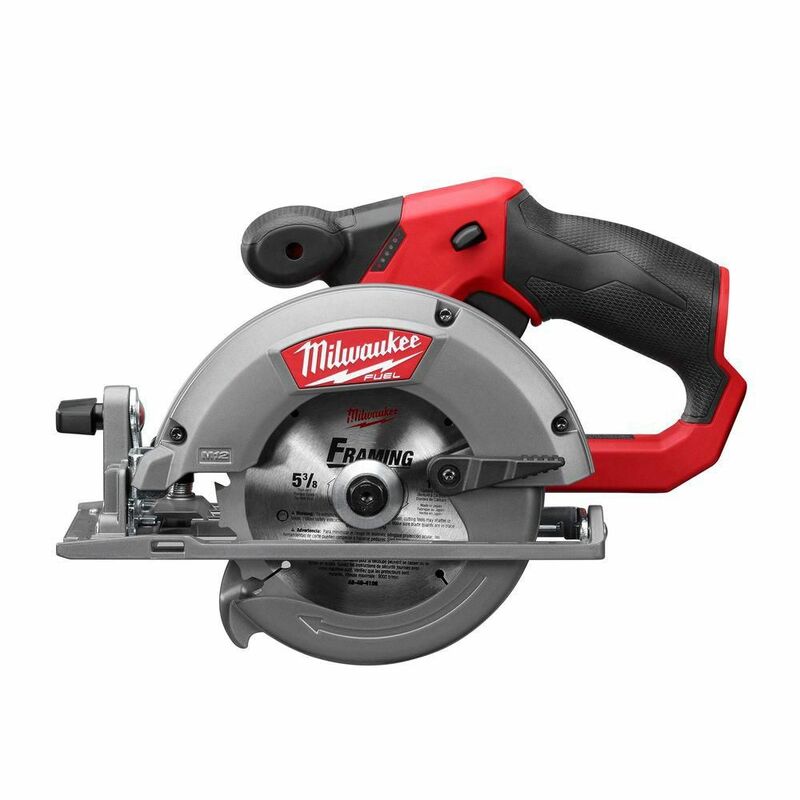 With a cut capacity of 1 5/8 inches for cutting 2X dimensional lumber, Milwaukee's M12 FUEL 5 3/8-inch circular saw delivers up to 170 cuts per charge and up to 2X the motor life of competitive products. It offers the ability to cut a wide range of common jobsite materials and was designed to deliver the power, runtime and durability required by professionals. The POWERSTATE brushless motor outperforms all leading competitors with constant power output, yet runs cooler with no wearable components, and the REDLINK PLUS Intelligence ensures optimized performance and protects your tool from overload, overheating, and over-discharge. Extremely light weight design at 5.35 lbs. M12 FUEL 12V Lithium-Ion Brushless Cordless 5-3/8-Inch Circular Saw (Tool-Only) With a cut capacity of 1 5/8 inches for cutting 2X dimensional lumber, Milwaukee's M12 FUEL 5 3/8-inch circular saw delivers up to 170 cuts per charge and up to 2X the motor life of competitive products. It offers the ability to cut a wide range of common jobsite materials and was designed to deliver the power, runtime and durability required by professionals. The POWERSTATE brushless motor outperforms all leading competitors with constant power output, yet runs cooler with no wearable components, and the REDLINK PLUS Intelligence ensures optimized performance and protects your tool from overload, overheating, and over-discharge. M12 FUEL 12V Lithium-Ion Brushless Cordless 5-3/8-Inch Circular Saw (Tool-Only) is rated 4.5 out of 5 by 187. Rated 5 out of 5 by Johnson from This thing cuts through plywood like nobody’s business.... This thing cuts through plywood like nobody’s business. Rated 5 out of 5 by TheHandyman from Better than expected. Used many times and still on first... Better than expected. Used many times and still on first battery. Great size for smaller cuts and quick projects. Very happy. Rated 5 out of 5 by HomeDepotCustomer from Light, accurate, superb!!... Light, accurate, superb!! Rated 5 out of 5 by TotalAccess from I bought this saw for demo work. We are always cutting in strange places at strange angles. The s... I bought this saw for demo work. We are always cutting in strange places at strange angles. The saw works as it should. Way better than a big saw dragging a cord.